The SC L7 Series pump has a 7" diameter air drive section and stainless steel wetted parts in the hydraulic section. This double acting pump is equipped with a double air motor drive section that roughly doubles the liquid outlet pressure compared to an equivalent single air motor design. 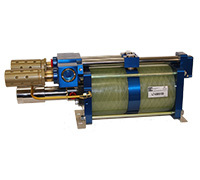 It is capable of hydraulic pressures up to 12,800-psi at 100-psi drive air pressure. This pump is ideal for high flow at relatively high pressure applications. Nominal outlet flow ranges between 2-gpm to 1-gpm depending on outlet pressure. Maximum air consumption is approximately 210-SCFM at free flow (zero output pressure). It is designed to operate with air drive pressures between 15-psi and 100-psi under normal conditions. Typical applications include choke control operation, hydrostatic pressure testing and press applications. Additional modifications may be included with an "M" suffix at the end of the model number. 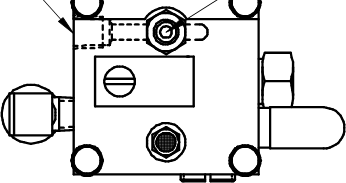 Remote Pilot: This option provides a 1/8" NPT female port for remotely controlling the start/stop of the pump by connecting an external air signal to actuate the air cycling valve. This modification is built in as standard and no special number is needed when ordering. M014 - Counter Port: This option provides a 5/8-18-UNF thread port on the air motor section of the pump for installing a mechanical cycle counter.